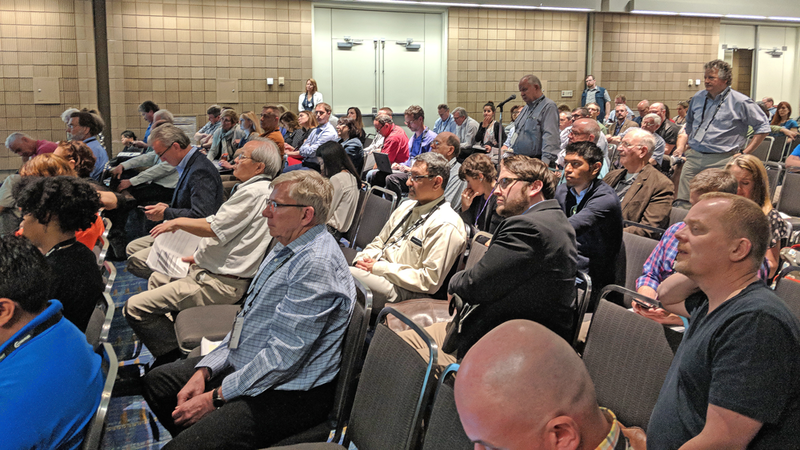 “Getting Ahead of Driverless Cars,” led by speakers Don Elliott, FAICP, Nico Larco, and Kelley Coyner, attracted a packed house. Elliott, a director with Clarion Associates, helps cities get ready for autonomous vehicles (AVs): “This technology is coming on faster than we thought. It seemed like the Jetsons but now it’s coming." But even with the exponential growth and strides being experienced in the AV world, we have some growing pains to get through. An area that will see big changes — and challenges — is infrastructure. Because AVs can more accurately and efficiently navigate and park than human drivers, the speakers anticipate a reduction in needed road and parking space. Elliott recommends revising parking design standards with a wider range of adaptive uses and, eventually, AV-specific parking facilities. Attendees were eager to join the discussion. Photo by Molly Walsh. The speakers agreed: AVs aren’t coming, they’re here, and we need to start planning for them now. Top image: Speakers Don Elliott, FAICP; Nico Larco; and Kelley Coyner get ready to address a packed house. Photo by Molly Walsh. Molly Walsh is APA’s program and events marketing manager.